Elton Joseph… 2007 Bahamian Jr. Champ! Elton Joseph (left) trots out the "Parham Attack" against an opponent. Photo by Bahamas Chess Federation. 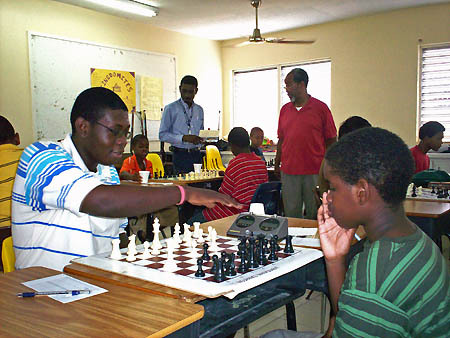 Kean Smith, "ELTON repeats as Bahamas Junior Chess Champion," 19 August 2007. After four rounds of Chess play, Elton Joseph won The 34th Bahamas Junior Chess Championship ahead of eleven other competitors making this the fourth time he has won this title. This follows a string of impressive tournament play after a disappointing result in The Bahamas National Chess Championship 2006. In May of this year, Elton won the Pohlemus Darling Memorial. This was followed by his second place finish in the 1st Founders Chess Classic 2007 which was both BCF and FIDE rated. 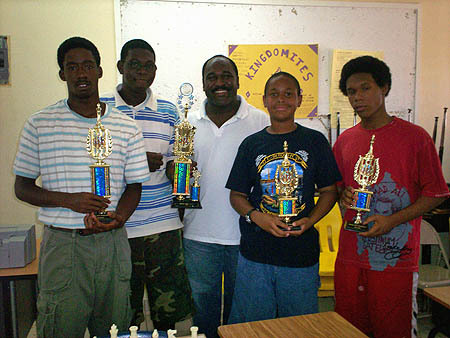 Elton shared second place with Bahamas National Chess Champion Charles Duncombe, and former National Champion Franklyn Gibson. Elton is a student at the College of The Bahamas, Nassau Campus. Kristian Plakaris and Sanchez Brown finished second and third respectively. In February and March of this year, Kristian won the Under 18 Division of The 1st Bahamas Youth Chess Championship 2007, and The Scholastic Individual Chess Championship. Last year, Kristian qualified to play in The Bahamas National Chess Championship 2006 but decided to play in The Bahamas Junior National 2006 instead. Kristian is a recent High School graduate. Top finishers-from left Kristian Plakaris, Elton Joseph, Kean Smith, Dante Delaney and Sanchez Brown. Photo by Bahamas Chess Federation. 1st Elton Joseph, 4-0; 2nd-4th Kristian Plakaris, Sanchez Brown, Dante Delaney, 3-1; 5th-7th Akini Morris, LeShawn Smith, Travis Miller, 2-2; 8th-9th Sameer Chopra, David Bullard 1½-2½; 10th-11th Gary Black, Javon Parker 1-3; 12th Gary Deal-Larado 0-4. Dante Delaney and Akini Morris who both finished tied for first place in the Under 12 Division of The 1st Bahamas Youth Championships 2007 played well in this tournament. Dante attends St. Augustine's College, and Akini attends Nassau Christian Academy. These are two of the young sparks in the Bahamas Chess Federation that we will keep our eyes on. During the awards ceremony the BCF President, Kean A. Smith, informed the juniors that it is the Federation's intention to organize a two day visit to Freeport, Grand Bahama where they will be able to compete, and socialize with their chess counterparts in that city. Howard Taylor from Grand Bahama was one of the spectators at the tournament. Howard and two others from Freeport participated in the Pohlemus Darling Memorial which was held in May of this year. Howard is seen below posing with Elton and Kristian. 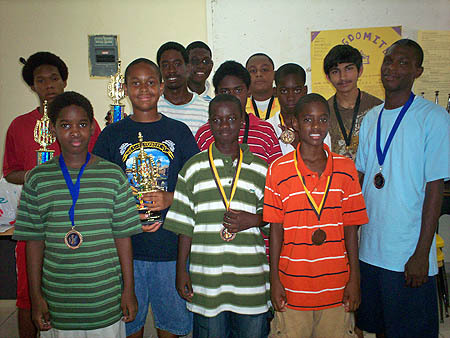 Participants of 2007 Bahamas Jr. Championship - from left Sanchez Brown, Akini Morris, Dante Delaney, Kristian Plakaris, Elton Joseph, Javon Parker, Gary Black, Gary Deal-Laroda, David Bullard, Travis Miller, Sameer Chopra and LeShawn Smith. Photo by Bahamas Chess Federation.